The saying “two minds are better than one” rings especially true in the field of global health innovation. For grantees and finalists of the Saving Lives at Birth (SL@B) program, the DevelopmentXChange (DevX) is an annual event that brings together innovative minds from across the world, producing excellent opportunities for partnership development. 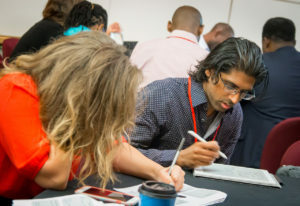 From partnerships with peer-innovators with complementary technologies, to investors and distributors, SL@B innovators have made a wide range of connections by attending DevX. The event provides interactive workshops, mentorship and partnership meetings, and ample networking opportunities, including an Innovation Marketplace where all innovators can showcase their projects. Through these elements, DevX fosters a collaborative atmosphere that has contributed to the successful development of numerous partnerships. While the types of collaborations are diverse, there are common themes in how they have been beneficial. Three SL@B innovator teams shared their experiences: Donna Brezinski of Little Sparrows Technologies, inventor of the Bili-Hut; Darash Desai of Boston University, with PharmaChk; and Victoria Oliver and Pete Lambert of Monash University, innovators of a formulation of inhaled oxytocin. Boston University’s device, PharmaChk, provides a platform to test counterfeit drugs in low-resource settings. Through partnering with the United States Pharmacopeia, an organization that sets drug standards, Darash Desai’s team has a better understanding of the local context and needs on the ground. This partnership has also provided guidance in the creation of quality indicators for testing counterfeit drugs, allowing his team to focus their development efforts on the most critical aspects of the innovation. This contextual benefit is similar for Victoria Oliver and Pete Lambert, whose partnership with the Community Empowerment Lab, a global health research organization based in India, has deepened their understanding of, and research in, the local landscape. In addition, a partnership with the pharmaceutical company GlaxoSmithKline (GSK), who approached Monash University after they won the DevX peer choice award in 2011, has enabled them to leverage a new range of capabilities. “To develop a product there are so many activities that need to be conducted with so many different skillsets and capabilities – that does not exist in one entity or organization,” Oliver notes, “so it is just so essential to be partnering with different groups that have that skillset that know how to do that piece of work well.” Lambert also added that partners have the benefit of providing a fresh perspective to challenge your assumptions, to help you work through problems, and to keep yourself on track. Implementation partners, Brezinski explains, can serve as champions to help introduce your innovation in areas of need, and bring an intimate knowledge of key stakeholders in the area. For example, Little Sparrows Technology’s co-principal investigator, INMED Partnerships for Children, will be implementing the Bilikit within the government healthcare system in Peru. Establishing the political will and local demand for a new technology can pose many challenges to innovators; therefore, having partners with local sway can help influence the adoption and scaling of an innovation. Similarly, GSK has served as a champion and as a source of credibility for Monash University’s innovation within the broader pharmaceutical space. Having the continued support of an established pharmaceutical company will be instrumental in navigating the industry’s regulatory space. PharmaChk’s partnership with Merck Global Health Institute, an organization with access to inauthentic drug samples, will continue to be critical as PharmaChk scales. Another partner, SomaLogic, a clinical diagnostics company, will work with Desai’s team to pilot a methodology that has the potential to significantly accelerate the testing process. This will provide benefit to both partners, as Desai’s team tests SomaLogic’s methodology while also receiving help to expand the number of tests that can be run with the PharmaChk device. Through sharing resources, these partnerships can help make the scaling process both physically and financially feasible. While it went uncontested that partnerships – both formal and informal – are incredibly helpful for innovators who are seeking to proceed along the scaling pathway, it is not always easy to establish a successful partnership. She also notes that it is important to keep the conversation between partnerships organized and moving forward. For Brezinski, this involved creating agendas before calls and taking and distributing detailed meeting minutes on a regular basis to keep all partners on the same page. Lambert spoke to the benefits of establishing a common language across partners. When various groups are coming together, similar terminology can actually carry distinct meanings for different organizations. Therefore, Lambert advised innovators not to be afraid to clarify common language up front to avoid unnecessary confusion further down the road. As innovators in the SL@B program progress along their scaling journey, events such as DevX present an exciting opportunity for partnership development. Through working to foster productive relationships, innovators can leverage the numerous benefits to create impactful solutions to pressing maternal and newborn health issues. Since 2011, the SL@B program has selected promising innovations in maternal and newborn health, supporting them to grow their impact around the world. The SL@B program is funded by USAID, the Government of Norway (Norad), the Bill & Melinda Gates Foundation, Grand Challenges Canada, The UK’s Department of International Development (DFID), and the Korea International Cooperation Agency (KOICA). 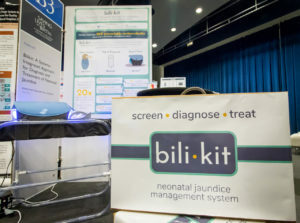 The Accelerating SL@B program, funded by the Saving Lives at Birth Partners and implemented by the Duke Global Health Innovation Center and VentureWell, provides tailored support to SL@B innovators. This product does not necessarily reflect the views of the Saving Lives at Birth partners. Copyright © 2019 Global Health Innovation Center. Powered by WordPress. Theme: Spacious by ThemeGrill.